Google Drive on CGXchange will have a brand-new look and will include several changes to consider. 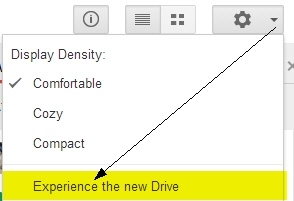 While most of the changes on the new Drive are in regards to its design and user-experience, Google also added some additional functions which you may find useful. Please check this video below, which includes a quick walk-through of the functions described further in this tutorial. Note the new Google Drive is still not on for everyone on CGXchange, but it will appear automatically for all soon. If you want to start experiencing the new look and feel today, click on the geer icon from the https://drive.google.com/a/cgxchange.org/ page, and select ‘Experience the new Drive’. The ‘Shared with me’ menu has been renamed ‘Incoming.’ From here you’ll find all files that someone has shared with you, but that you are not the owner of. To mark an important file, you now have to right-click on it and select 'Add Star'. In contrast, this new method is less direct compared with the old version of Drive where you were able to select the star icon next to the file name. Now you can easily access the Link to Share by selecting the file and clicking on the ‘Show link’ icon located at the top right of the Drive screen (or by right-clicking the file). From here you not only have the ability to copy the link to share to send to other users but you can access the file’s sharing settings to change its permissions. The new Office Compatibility Mode to edit Office files in Drive has become more integrated. Now you can use this feature simply by double-clicking on the Office file(e.g. : Word file) in Drive from a Chrome browser, and it will open in a compatible program for editing. Note: To be able to edit Office files from a Chrome browser, first download the Office Editing for Docs, Sheets & Slides Chrome extension. This will basically create a copy of your Office file in the Google editable format which you can use to further edit. One of my favorite features is the possibility of selecting multiple files and performing a certain action, such as sharing or moving them to a particular folder. One key feature missing on the Drive on the web is being able to copy and paste copies of folders and files as you can already do with the Google Drive app. I trust this feature will be added soon! Enjoy your new Drive on CGXchange!